BH has chosen the path of Classical Veterinary Homeopathy and Animal Reiki for the health care of our animals, for daily wellness as well as during hospice care and the dying process. There are also many other holistic pathways available for you to choose from and we have pleasure in listing some of them here for your review. A practitioner in any one of the following three healing practices may be selected to be your main veterinarian in charge of the healthcare protocols for your pet. Homeopathy is a complete form of medicine and should not be confused with or mistaken for the term holistic. Professional veterinary homeopaths are qualified DVMs (conventionally trained veterinarians) and so by the time they commence learning homeopathy, they are already qualified to treat animals. BrightHaven homeopaths are in contact with us all through the journey. We talk with them often to ensure as much comfort and peace as possible. The benefits of homeopathy are extensive. It is completely natural, with no toxic side effects, and is affordable. The remedies are easy to prepare and administer. You can consult by telephone—just think of the huge benefit this can be for your animals, as they can avoid the stress of the trip to the veterinary hospital or clinic. Stunning miracles have occurred at BrightHaven in the many years we have used homeopathic support. You can find more information about Homeopathy at Academy of Veterinary Homeopathy. Acupuncture is a technique for relieving pain and for improving the function of organ systems by stimulating acupuncture points on the surface of the body. It has been used in China for over 3500 years and is the main treatment for a quarter of the world’s population. The primary aim of veterinary acupuncture is to strengthen the body’s immune system—to stimulate the body’s adaptive-homeostatic mechanism. Acupuncture treatments elicit responses which regulate physiological processes. 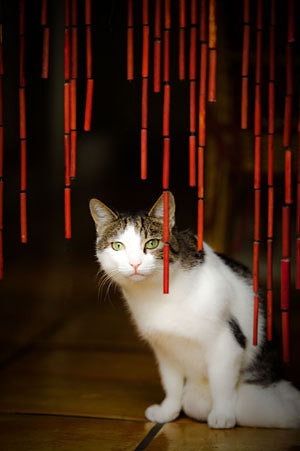 You can find more information about Acupuncture at International Veterinary Acupuncture Society. For thousands of years holistic Traditional Chinese Medicine has successfully kept people healthy and promoted quality of life and longevity. 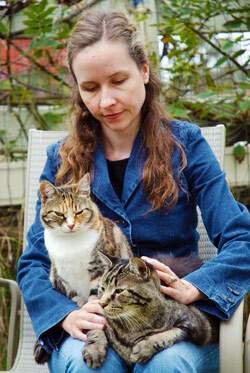 This ancient medicine focuses on animals and people, working with them as individuals. It helps to restore well-being, addressing all levels including spiritual, emotional, mental, and physical. You can find more information about Traditional Chinese Medicine at Traditional Chinese Medicine World Fundation. Animal communication is the ability to converse with animals through telepathy, the universal language of all beings . The practitioner establishes a telepathic link with the animal and an exchange of pictures, thoughts, words, emotions and feelings can be exchanged. At birth, all beings have telepathic abilities but for humans, this ability atrophies with socialization and the use of spoken language. Animals do not lose this ability and can easily communicate with each other and humans via this universal language. 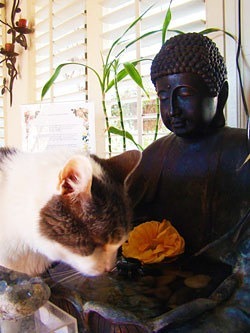 You can learn more at The Temple Cat. Reiki, pronounced “ray-key,” comes from the Japanese words “rei” (spirit) and “ki” (energy). It is usually translated as “universal life energy.” Reiki is a Japanese holistic energy healing system that is gentle, non-invasive, and yields powerful results for the body, mind, and spirit. The practitioner simply channels this universal energy through the hands to the patient. When using Reiki with animals, effectiveness of the treatment is not dependent upon physical contact, and the animal is allowed to control how the Reiki treatment is accepted, whether it is from a distance or by direct laying on of hands. You can learn more at Animal Reiki Source. Aromatherapy is the inhalation and bodily application of essential oils from aromatic plants to relax, balance, rejuvenate, restore or enhance body, mind, and spirit. A basic principal of aromatherapy is to strengthen the self-healing processes by indirect stimulation of the immune system. The depth of the use of essential oils is quite complex, ranging from deep and penetrating therapeutic uses to the extreme subtlety of a unique fragrance. Aromatherapy is considered by some to be an ancient yet timely and modern approach to total well-being that is in tune with nature. You can learn more at National Association for Holistic Aromatherapy. Ayurveda is one of the world’s oldest systems of health care, originating from the Indian subcontinent. People and animals are viewed as a mixture of three different energy types, known as “Doshas,” which describe their physical and psychological make-up. Of most importance for any individual is to maintain the balance of the three Doshas called Pitta, Kapha, and Vata. The key to this process is the immune system and the body’s natural ability to maintain its own balance and health—homeostasis. When the Doshas become out of balance, the immune system can be weakened, leaving the body more prone to illness. You can learn more at The National Ayurvedic Medical Association. The Bowen technique helps the body remember how to heal itself. It is not massage, acupressure, or chiropractic. There is no manipulation, adjustment, or force used. The practitioner uses thumbs and fingers to gently move muscles and tissues. In between each set of moves, the practitioner leaves the room. These pauses and the gentleness of the treatment are what make Bowen unique. It offers rapid, long-lasting relief from pain and discomfort. Most conditions respond within 2-3 treatments. The gentle yet powerful Bowen moves send neurological impulses to the brain, resulting in immediate responses of muscle relaxation and pain reduction. The moves create energy surges. Electrical impulses sent to the nervous system remind the body to regain normal movement in joints, muscles, and tendons. You can learn more at The Bowen Technique. CST is a gentle, hands-on method of evaluating and enhancing the functioning of the craniosacral system. Using a soft touch, practitioners release restrictions in the craniosacral system to improve the functioning of the central nervous system. By complementing the body’s natural healing processes, CST is increasingly used as a preventive health measure for its ability to bolster resistance to disease. It is effective for a wide range of medical problems associated with pain and dysfunction. You can learn more at Biodynamic Craniosacral Therapy Association of North America. The founder of flower essence therapy was an English surgeon named Dr. Edward Bach. He was a pioneer in understanding the connection of our emotional bodies to our physical health. The 38 original flower remedies, known as Bach Healing Herbs, were used to treat the underlying emotional causes of diseases. The living forces of nature collected from the blooms of flowering plants are used for healing a wide variety of physical and emotional imbalances and diseases. Today, a multitude of flower essence remedies exist in addition to the original 38 developed by Dr. Bach. You can learn more at Bach Flower. Gentle dental treatment is teeth cleaning without anesthesia. Although anesthesia is considered relatively safe, it is not without risks. There are some animals who, because of medical conditions or age are not good candidates for anesthesia. Teeth cleaning remains a priority for these animals and gentle dental can be a good alternative to the use of anesthesia for veterinary dental care. You can learn more at Gentle Dental For Pets. The use of specific herbs and plants for medicinal purposes has been practiced for millennia all over the world. Veterinary herbal medicines include North American herbs, Aryurvedic herbs from India, traditional Chinese herbs and other herbs from all over the world. Herbs have healing powers that are capable of balancing the emotional, mental, and physical dimensions of animals. You can learn more at The Veterinary Botanical Medicine Association. Jin Shin Jyutsu is an ancient art of harmonizing the life energy of the body system with the Universal Pulse (rhythm), the Creator’s Art, an innate part of human wisdom. Jin Shin Jyutsu was widely known before the birth of Guatama Buddha in India, before Moses, and rediscovered by Jiro Mauri in the Kojiki: Record of Ancient Things, 712 AD. According to this practice, there are three vital energy pathways that balance the mind, body, and spirit connecting through twenty-six key energy point locations within the body called Safety Energy Locks. They unlock and release stagnated or blocked energy and tension allowing the energy to flow free in its natural harmonious pattern. The practitioner uses the hands and breath to help regain harmony and balance. You can learn more at Jin Shin Jyutsu®. TTouch—the Tellington TTouch—is a method based on circular movements of the fingers and hands all over the body. The intent of the TTouch is to activate the function of the cells and awaken cellular intelligence—a little like “turning on the electric lights of the body.” The TTouch is done on the entire body, and each circular TTouch is complete within itself. Therefore it is not necessary to understand anatomy to be successful in speeding up the healing of injuries or ailments, or changing undesirable habits or behavior. You can learn more at Tellington TTouch. Veterinary Chiropractic offers a holistic approach to the muscular-skeletal system, primarily the spine and the relationship of the spine to the nervous system. Healing potentials can be achieved through chiropractic treatment that are not achievable by other forms of therapy. In chiropractic, the subluxated or fixated vertebra is identified and through hands-on specific adjustments, the problem is alleviated and homeostasis is restored. You can learn more at American Veterinary Chiropractic Association (AVCA).